All other dinosaurs fear the t-rex. Wanderlust is exactly the opposite of how Dom and I felt yesterday. I felt the innate desire to travel home to my own bed. Two days ago we rode from the city of Merida in the Northwest Yucatan to Isla Holbox (pronounced hol-bosch) . Spirits were high as we were planning to take Sunday off on a small tropical island, that would've been the first day entirely away and off the bikes. As we progressed further into the Yucatan over the last few days, pueblos and cities have taken on a unique vibe from the rest of the country. Buildings and homes are painted bright pastels, with cracked and chipped stucco making them seem almost ancient. Inhabitants rely less on farming, mining, or industry for occupations and more on the sea. Little villages have tables on the side of the road (less than 2 feet from my foot pegs) filled with heaps of cameron's (shrimp). Signs for fresh fish, crab, and lobster abound. All of this served to heighten our anticipation for our day off on sleepy Isla Holbox. Dom was not happy with my choice of seats. What we didn't know is that it had been raining most of the day on Isla Holbox. We boarded the ferrry like two kids preparing to open their Christmas presents. I insisted on sitting atop the ferry much to Doms dismay (he was worried about a little sea spray... Pshaw). About half way from the town of Chiquila to Isla Holbox we could see the down draft of an approaching thunderstorm, it's huge drops splashing in the water ahead of us. We promptly tried to run below decks, but it didn't matter we were still drenched. "I have never been this wet in my life! ", Dom exclaimed, it didn't matter to us because we were laughing hysterically. Isla Holbox was flooded, the streets were rivers, we forded our way through the via ducts to the hostel. It rained all night. The next morning lagoon sized puddles were left in the roads and with the rain came the smells. The whole island didn't smell that good. We tried to swim on the beaches but because of the flooding the water was cloudy and smelled of rotten eggs. The tourist-less white sandy beaches and water more shades of blue than you can count, that we had imagined did not exist that day (The island has a lot of potential and someday I would like to go back) . Feeling demoralized we decided to forgo our day off and left late in the afternoon for the 2 hour drive to Tulum. We decided to take today off instead to swim with turtles and visit the ruins. 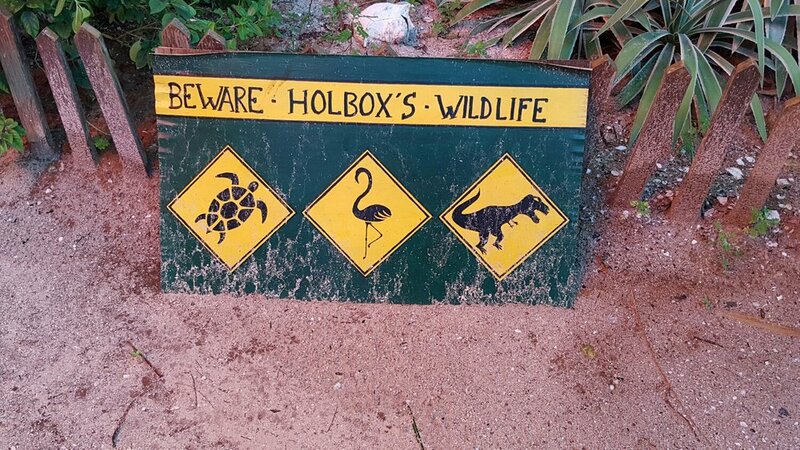 We made the right choice, not necessarily because it is much better than Holbox, we have had great weather here. We even had time to prepare Hans and Franz for the trip through Belize tomorrow. Dom fine tuning Hans' chain. Along the way so far we have met only exceptional people. The folks we've met at the hostels and hotels have been extremely helpful. Dispensing advice on all the good places to eat, how to avoid American tourists (yes that's a thing, after going to Tulum today I can see why, that's a story for another time), and regaling us with their travel stories. We've met travelers from around the world. One group an Australian and Scot have been traveling for 9 months! We recently met three German siblings who are traveling to Mexico city for college, we've enjoyed their company so much we had drinks last night with them, as well as lunch and dinner today. I will miss them when we leave tomorrow. I am thankful to have Dom as my companion, but I think he'd agree, life on the road is still a lonely thing (and it's only been 2 weeks). 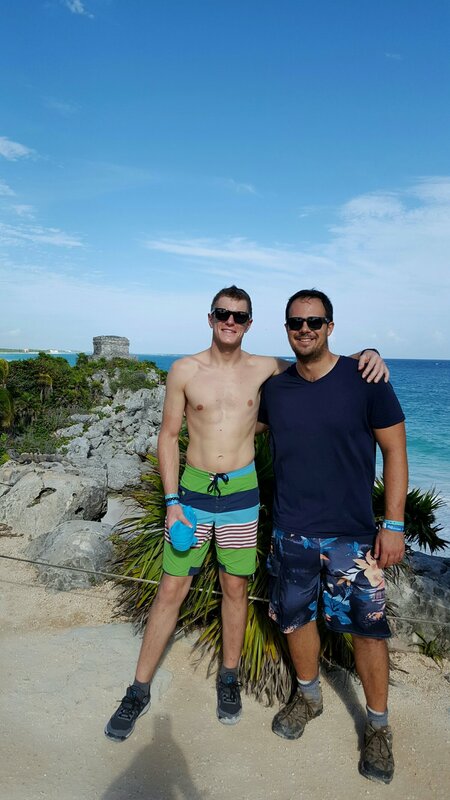 Dom and me at the Tulum ruins. I still have yet to meet a malicious Mexican. Before we left people would tell stories that made it sound like citizens of Mexico would rob you (or worse) as soon as look at you. They said the federales and policia were corrupt, hands constantly out for a bribe. None of this has been further from the truth on our trip so far, I'm not saying bad people don't exist here, there are always bad people somewhere (yes, even back home you know who you are) . We've had people take pictures with us, wave at us on our bikes, and our poor Spanish is always greeted with a patient smile. A policia in Campeche flagged us down, moving parked scooters to the side to fit our motorcycles in the small parking spaces. He then proceeded to give directions to a good lunch spot. One hour later when we came back to our bikes he was still standing there watching over them (m-16 in hands). We bought him a coke as thanks, after which he stopped on-coming traffic for us to pull out of the spaces. Thank you for your hospitality Mexico, but we are ready for Belize. Maybe we'll see you on 'the way south'. Bonus: playing and stuck in the sand outside of Cuidad del Carmen.